Neither stability nor change in the post-colonial Arab world can be fully understood without considering the international context, and American Foreign policy in particular. However, the exact nature of America’s presence in the Arab world, and the scope and modes of its influence, all appear to have reached a crossroads since the Arab uprisings. ‘US Hard Power in the Arab World’ traces the US’s "power of persuasion" in the Arab Middle East from the onset of the War on Terror in 2001 through to the Arab Spring. With a particular focus on Syria, the book explores the limits of an American "smart power" amid the emergence of a growing indigenous "soft power" whose ire is directed not only at Assad’s regime, but also at the violence perpetrated or enabled by the international community, headed by the US. It is argued that the blurring of the two forms of "soft" and "hard" American power has tarnished the credibility of US policies geared to win hearts and minds in the Arab world. 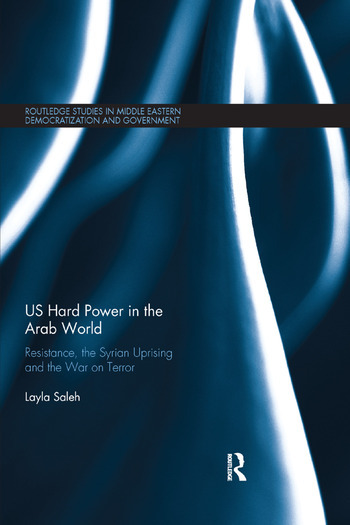 ‘US Hard Power in the Arab World’ narrates the contests between attraction and intimidation, public diplomacy and military occupation, elites and publics, seduction and resistance. Drawing upon a multitude of primary sources, including personal interviews with Syrian activists and opposition figures, this book will be a valuable resource for students and scholars of Middle East Politics, as well as those concerned with American Foreign Policy and the Arab Spring. Layla Saleh is Assistant Professor of International Affairs at Qatar University. She holds a PhD in Political Science from the University of Wisconsin-Milwaukee, America.